When I awoke this morning, all was going to be well. Then I had lunch with some lovely people, and enjoyed the wife’s dessert immensely. Five minutes later, when my mouth felt like fire ants were fighting a war in there, I calmly asked if there had been walnuts in the dessert. “Why yes,” the kind woman responded, “finely ground for the best flavor.” Benadryl. Home. Bed. 2 Hours of induced sleep. Check. Feeling I had timed it all spectacularly, I went to work feeling quite well, though my mouth was perhaps a little itchy still. Minor offense indeed. I should here suffice it to say that my Lymphatic System is working spectacularly these days. The walnut bit went off alright, so why not add a little something to the pot and see if the ol’ body held up? How about…..oh yes, a scorpion sting……..make that a triple shot. The little bugger had crawled up inside my pantleg while I was working, because, really, I need more excitement in my life. Oh my…quite a busy day. I believe once eternity is fully realized, the walnut, the scorpion. and the Nicole will all lay down together, in peace. Were you stung in the ankle? You can add bears, cows, and giant pet turkeys to that list too. Ouch! No. I do not like this post. Not one single bit. Stung in the calf….three times right above my sockline. Les, I don't like this post one bit either. Barger, your goodness doesn't even enter into it. Could have been planted. 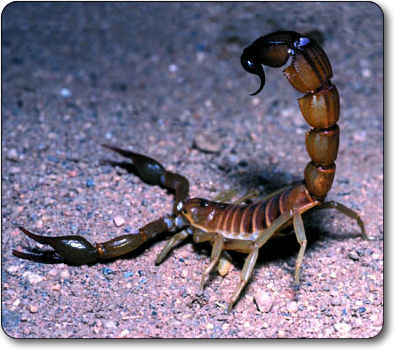 Have you scorned anyone for being afraid of scorpion stings? Watch your back. Graham! Good to hear from you! I will call you soon, and hope that you have arrived safely in your new home. Look forward to talking to you, brother. that this post immediately follows the previous one. Or is it only my life? Maybe it's just a helpful reminder not to post about man-eating gorillas or flying sharks. If blogging has the capacity instigate events, perhaps write about lottery winnings and showers of roses falling from the sky.